I love this so much, I’ve made it twice this week and I even eat it for breakfast. Now before you judge me, a portion of this (1/8th) is HEALTHIER then your beloved flavored Quaker Oatmeal packets or Yoplait yogurt cups, and frankly much more satisfying. This cobbler happens to naturally be low in fat (though I have nothing against fat, it’s not the enemy), low in added sugar, has far less chemicals, can easily be tailored to work around your allergies (gluten, dairy, nuts), come together pretty quickly and uses only a few simple ingredients. The way I see it, that’s a win across the board, right?? If you love cobbler and oats, then you MUST try this. Seriously. GLUTEN FREE- make sure the oats you use are certificated GF is you are very sensitive to gluten. The almond meal is already GF, but you can sub it a GF flour blend and even ground up oats if that’s all you have. DAIRY-FREE- in place of the egg you can make a “flax egg”, which is 1 tablespoon flax meal plus 3 tablespoons water. You can also use the “Ener-g” brand egg replacement, follow instructions on the back of the box. As for the butter, you can use a substitute, such as Earth Balance or ghee (butter with the milk proteins removed). NUT ALLERGY- simply replace the almond meal with regular flour, or any flour you can tolerate. For the most part I followed the recipe here, with just a couple minor changes. I used organic nectarines, which were already VERY sweet. So the first time around, though delicious, it was a bit too sweet for us. So I cut down the overall sugar in the recipe by about 3 TBLS, and then it was perfect. I used Pamela’s GF baking & pancake mix in place of the almond meal (as that’s what I had on hand) and used almond milk for the liquid. 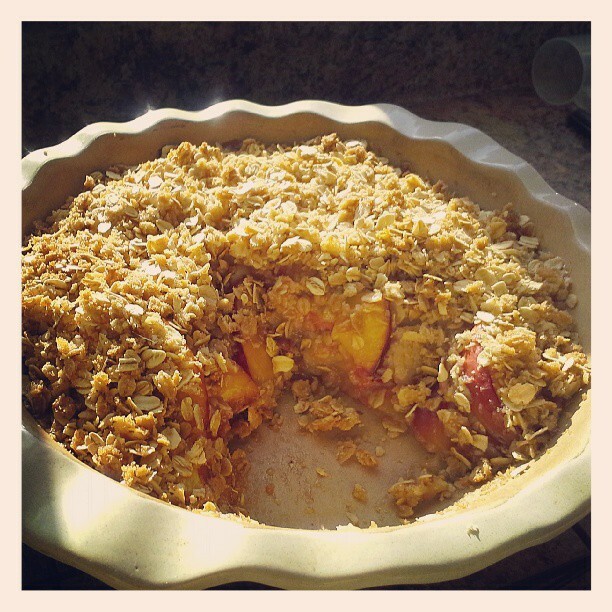 And lastly, since I like a lot of oats & batter with eat bite, I cut down to 4 nectarines, PERFECT. The cobbler topping is a bit loose/crumbly, if you prefer it to be more “put together” you will need to add more butter/fat to the oatmeal crumble mixture. I personally liked it the way it was, as it compliments the batter underneath the fruit really well. You know…moist batter, fresh fruit, crisp oats, YES. And I may be a little strange, but I prefer mine cold.